When it comes to the Jungle Navigation Co. Ltd. Skipper Canteen, not everything tastes like chicken, which I am personally thankful for since today we’re reviewing a pair of desserts. What they like in chicken flavoring, however, they make up for in exclamation marks. No joke, the menu listing for these two sweet dishes include no less than four exclamation points, and that’s just in their names! So buckle up your taste buds for this tour of the Kungaloosh! and Quick Sand!!! Let’s start with the Quick Sand!!! 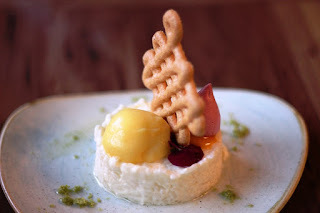 This dish is a jasmine rice pudding with a mango sauce, lemon curd, hibiscus meringue, and pineapple. It also comes adorned with a crispy cookie. The rice pudding base of this dessert is not the typical mush you think of when you think of rice pudding. It was firm with a creamy texture, with pieces of rice that were definitely still present throughout each bite. It was sweet, but mildly so, allowing the other flavors on the plate to shine through. The bright flavors of the lemon and mango were accented by the underlying floral notes from the hibiscus meringue. This is a much more tropical feeling dessert than you would think first looking at it. The waffle cone-esque cookie perched atop the whole dessert was, again, not too sweet, but added that little bit of crunch that was wonderful and was perfect for scooping up loose bits of curd and pudding. On to the Kungaloosh! While this dessert may only have one exclamation point in its name, which has a historical pedigree all to itself, it is no less exciting. 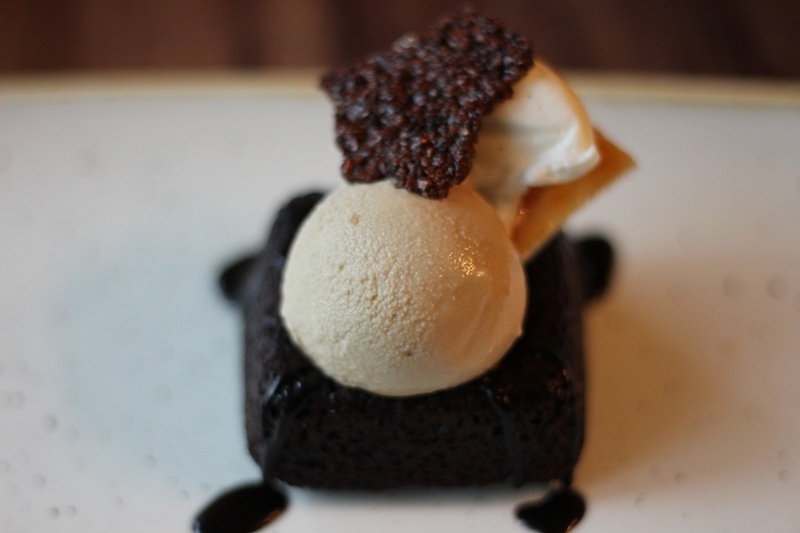 This offering is an African-inspired chocolate cake that comes with caramelized bananas, cashew-caramel ice cream and is topped with coffee dust. Full disclosure, as I am not a coffee fan, I opt to have the coffee dust left off. This cake was rich and dense and wonderful, think of it like the best brownie you’ve ever had and you’re getting close to the texture and richness of the dish. The nuttiness and sweetness in the ice cream brings out the best of the chocolate cake and the caramelized bananas are just, well, bananas! I mean that in the best way possible of course. For those of you who grew up on peanut butter and banana sandwiches, this dessert takes all the best of those memories and adds chocolate and ice cream to it. What more could you ask for! The sweet course at Jungle Navigation Co. Ltd. Skipper Canteen is filled with desserts that look almost too good to eat. They are honestly some of my favorite photos to take when I can grab a seat in the old mess hall. But no one is going to order a dessert and not eat it; that would just be silly. Luckily for guests, these dishes are a good as they look and deserve every exclamation point you can put in their names!